Salle de bains 1 dispose d'une douche, lavabo et wc porte-serviettes. Salle de bains 2 a baignoire, douche, wc, bidet, lavabo et porte-serviettes. À l'extérieur: Meubles de patio en osier avec des coussins de crème et des chaises longues. Buanderie: Lave-linge, sèche-linge. Service de nettoyage / serviettes / / Femme de ménage: La propriété sera nettoyé et préparé pour l'arrivée, un ensemble de serviettes et les draps sont fournis par personne, si en milieu de semaine propre et fraîche linge de lit est nécessaire ce qui peut être mis à disposition à un coût supplémentaire. Autre: Toutes les chambres sont équipées de téléviseurs et lecteurs de DVD et les placards. Apartment lovely and really big, plenty room if there were 6 of you, only 3 of us so we had a room each. Beds weren’t the greatest ...but think that’s common across Spain, haven’t had a comfy one yet. Lovely roof terrace and an additional private terrace with plenty loungers. All amenities that is required. The owner responds very quick if you have any queries. However they are very short replies, so maybe something to learn from that travellers need as much information as they can get to plan their holiday. Transfers and meet and greet were arranged by owner and Barrie was very prompt in contacting and super informative as to how everything works and where to go for shopping etc and can text if need be. Would have struggled a bit without this. 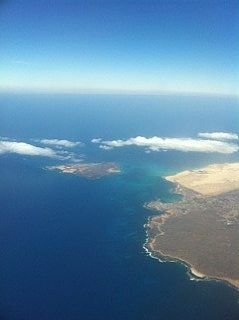 Complex is lovely and the views over Corralejo are amazing. As stated before pictures don’t do the complex or the apartment justice. Complex is much bigger than the photos and is very well looked after and feels very safe and much. Shops, bakery within walking distance and main Corralejo is a very pleasant 15 minute walk. There is a smaller shopping complex with supermarket and restaurants 5 minutes walk and very reasonable and food was lovely. Would advise that you stick to the smaller eateries as better quality than the larger touristy restaurants. Would definitely book this accommodation again and would recommend to friends. Absolutely love this spacious apartment/house. It has everything you could possibly need for a family holiday set in a lovely complex not too far from everything that's going on. Perfectly located for walks to the beach and the main street. We have stayed here before and will definately be returning. Been home a couple of days from El Sultan, we had a fantastic time the apartment was perfect for our needs with plenty of space, as we were travelling with two teenage daughters the two bathrooms and three bedrooms certainly come in handy. The apartment was well equipped with tvs/sky,washing machine,tumble dryer,fridge/freezer,microwave,oven and hob,safety deposit box etc. It had a lovely terrace on the first floor leading from the main bedroom, where i could sit and have a drink while waiting for three women to get ready. The location is also perfect there was a great bar (clarkies) just over the road,a few minutes walk to the water park which was a great day and about a ten minute walk to the main strip and the harbour, where there are loads of bars and restaurants to choose from and live entertainment, live bands,tribute acts etc,there are also lovely quieter cocktail bars and restaurants around the harbour looking out over the ocean if you want a more chilled out night. Finally Alan was very helpful leading up to the trip and always answered my questions quickly, I don't have anything negative to say we all had a great time and wouldn't hesitate to go back. Just got back from a wonderful week. Accommodation had everything we needed and more! It was clean and well furnished. It’s a real home from home and everyone enjoyed themselves. Excellent communication from the owners. Really glad you all enjoyed yourselves, we did have an informational guide at the apartment but seems to have gone missing anyway not to worry we will replace it ASAP also please don’t hesitate to contact us again if you wish to return as have many of our guests have done previous to your visit. Having recently stayed at this property with my family I would not hesitate to return to this fantastic accommodation. Ideally situated within a private complex not to far from all the main amenities, subject to the purpose of your holiday. Local hyperdino ( supermarket ) only a five minute walk, clarkies Irish bar is situated just a stones throw from the front door of the accomadation. It's only a ten minute walk to town town if you require a more lively evening. But also to be found in town are some fantastic restaurants ( reasonably priced ). Any type of European cuisine can be sought within the town. Had a fab stay here as a family of 4- everything is as (or even better) than described. First time in Corralejo and we loved it - location is perfect, close enough to all amenities but without being in the thick of everything! Loved the Campanario shopping centre which is a pleasant 5 min stroll and has everything you need if you don't feel like walking the further 10 mins into the centre. What more can we say but endorse all previous positive reviews ! Owners were very pleasant to deal with, very helpful and accommodating. We will not hesitate to stay here again as it was ideal for us and we this house in El Sultan was perfect. Plages de la ville sont à 10 minutes à pied avec les dunes de sable superbes juste une ride 5 minutes en taxi. Il n'y a qu'un seul aéroport de Fuerteventura, les transferts peuvent être organisés et prennent environ 40 minutes. Booking Notes: 25% deposit on booking (non refundable). Balance due 8 weeks prior to visit, also a 200 pound breakage deposit to be paid along with the balance which is fully refundable and will be returned in full if there is no damage or missing inventory. You are advised to take out holiday insurance suitable to your needs as the owner takes no responsibility for any loss, injury or accidents. Changeover Day: Flexible.